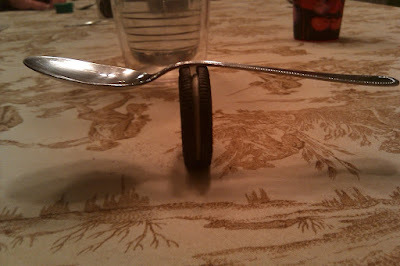 Years ago, I took a picture of my favorite spoon balanced on a cookie because I wanted to see if I could be the only person to ever do it, and rank high for it on Google. I discovered today that while it ranked in Google Images — only if you ever put quote marks around the phrase "spoon balanced on a cookie" — I had never actually put it in a blog post or anything. So here you go, a photo of my favorite spoon carefully balanced on an Oreo cookie standing on its side. Why, yes, I do have a lot of time on my hands. Why do you ask?